All parents look forward to the summer holidays; it means no more getting up early to drop the kids at school, spending extra time with the little ones and enjoying days out at local attractions. However, with such a long time off it can be difficult to find activities that won’t break the bank but will keep children entertained. Recent figures show that a typical parent will spend £251 on activities to keep their children occupied when they’re off school for the summer, with an extra £138 being spent on top of the usual household outgoings. This means that on average a family will spend an extra £389 when the children are off school. Luckily, there lots of free activities that children and parents alike will love. When you’re a parent it can be hard to have a chilled out day watching movies in your pajamas, but add a pillow fort into the mix and you may just get the relaxing day you want. Using pillows and whatever you have lying around the house, create a comfortable and snug fort. Everyone can get cosy, chill out and avoid spending a penny. Though there is an initial cost with buying card games and board games, they provide years of fun for the whole family. They’re a great go-to option to have when you’re struggling to keep children entertained. Investing in a card game such as Matchify can make staying at home or hanging in the garden just as fun as a family day out. 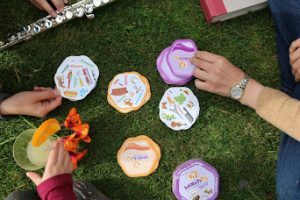 Matchify is suitable for all ages and can be played anywhere, so when the sun is shining it’s easy to take the fun outside. If you’re not opposed to a little mess in your home, arrange a scavenger hunt. Scavenger hunts are simple to organise and work well with children of all ages. Plus, everything you need can be found around the home. There are different ways to do a scavenger hunt but the best way is to write riddles and scatter them throughout the house and garden. Kids can then work together to solve the clues, enthusiastically trying to make their way to the end. Though it’s fun to get out and about with the kids during the summer holidays, it isn’t always affordable to head out to a local attraction every other day. With games like Matchify and organised activities in the home, kids can enjoy their time off school and you’ll save a little extra cash.